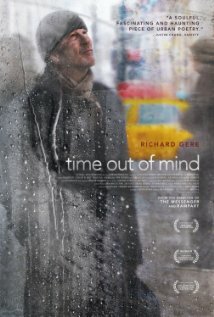 Movie Review: The timid, but ultimately affecting drama, “Time Out of Mind”, observes the daily routines of a New York City homeless, played expressively by the revived Richard Gere. The film opens with George (Gere), struggling with a hangover, being kicked out by the landlord of the house he occupies. His bed had been the bathtub of the house for a while, and now he’s forced to find a shelter to survive the cold winter nights. The difficulty of being accepted in these shelters, which demand curfews and upset the homeless with a bunch of undesirable questions, in addition to the bureaucracy involved in filing a supposedly simple application for emergency food stamps and cash benefits, almost drive him crazy. Yet, all these annoying issues are considered of minor importance when compared to the fact that his inflexible, estranged daughter, Maggie (Jena Malone), repudiates him in every attempt to establish contact. This is the most painful gap in his miserable existence. The messed up George, alternating between moments of consciousness (he finally accepts he’s homeless) and quasi-delusional states provoked by the alcohol, knows he’s got to try harder, even if he needs to humiliate himself in front of her. Apart from this emotional central idea, the film depicts a few idiosyncratic encounters with some of the quirky homeless characters who inhabit the shelter, cases of the inopportune Jack (Jeremy Strong), who even has a job, and the conflicting and mouthy Dixon (Ben Vereen), who claims he was a jazz musician and sticks to George as a bloodthirsty tick when attached to a source of nourishment. The quarrels between them are stupidly trivial, functioning as a natural constituent of their unassuming friendship. Richard Gere talks more through sad eyes and fatigued expressions than really through words, while writer-director Oren Moverman (“The Messenger”, “Rampart”), equilibrating pretentiousness and honesty, adopts a voyeuristic style, shooting obsessively behind glass windows to create image reflexes, layers, and overlaps.